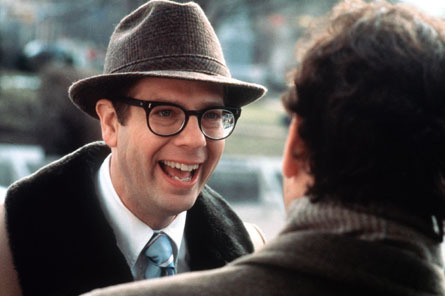 When Richard Curtis announced the premise behind his latest movie About Time, a romantic comedy in which it's hero could reverse outcomes of past events in order to woo the girl of his dreams, comparisons to Harold Ramis' classic Groundhog Day were inevitable. Yet, beyond the superficial similarities, the two movies could not be more wildly different in their execution, tone, level of quality, and achievement. Whilst Curtis' feature largely fails in it's aims of being a lightweight, whimsical melodrama, Groundhog Day achieves no less than setting the bar for which all mainstream cinema should aspire to reach, and also can lay claim to being amongst the most spiritual films ever committed to celluloid. Starring the ever wonderful Bill Murray, Groundhog Day takes the simple high-concept of a weatherman named Phil Connors who is forced to live the same day over and over again. Every single one of his actions are ultimately rendered inconsequential as everything is reset at the end of a 24 hour loop; Connors finds himself waking to the same cold February morning each day with a detached solitude stemming from a world around him which will not change. Having eternity in your hands could be a blessing if you know what to do with it, a curse if you find yourself lost in infinity without a reason to be. Phil Connors is a man who can only leave behind, transcend if you will, a humdrum and repetitively banal existence by fully applying himself to the pursuit of becoming a better person. Connors is doomed to live an unfulfilled existence until he abandons his selfishness and embraces wisdom, serenity and selflesness. In a repetitive world, Connors realises that the only thing he can change is himself. Incrementally and gradually he does so and in the process manages, perhaps for the first time, to see the love and joy in the world around him - he understands his true affections for his co-worker Rita (Andie McDowell) and aspires to become a person deserving of giving and receiving love. 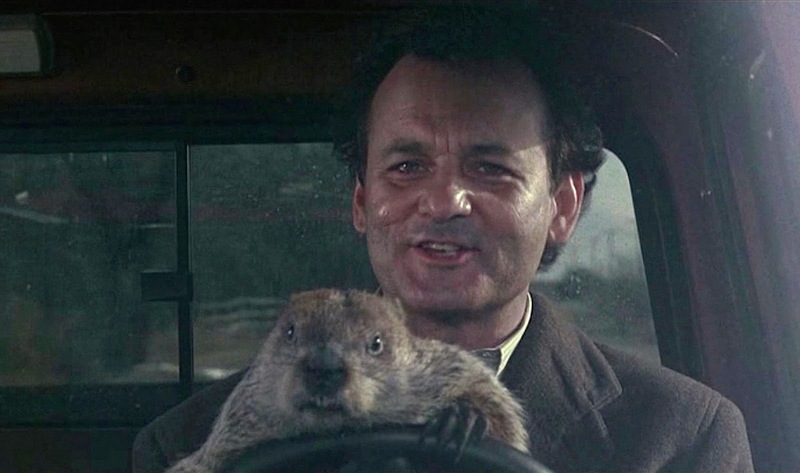 The only real problem with Groundhog Day is that it is so successful as a romantic comedy, so liltingly romantic and so belly-laugh inducing funny, that it's quite easy to look past the deep spiritual levels that are on offer too. It's a film which on one level plays out as the perfect, most exquisite example of a Hollywood high concept rom-com, and on another level as a deeply existentialist fable. Like It's a Wonderful Life, many remember the syrupy ending first and foremost, forgetting, by and large, the struggles our heroes endeavor to reach them. Redemption is an oft recurring trope in cinema but very rarely does it happen like this on such a profound spiritual level. Bill Murray delivers a potentially career best performance - it's his sarcastic, sardonic, curmudgeonly, cantankerous take in the first half of the film that anchors the movie and gives it its beating heart; any other actor would have been at risk of fear of portraying such a brutish, ugly character and negated the cynicism that is necessary for a transformation to flourish from. When Connors first discovers his plight, he leverages this to his advantage to gain temporary riches and to use information to seduce townsfolk too. Ultimately, these superficial gains amount to nothing - it's almost the cruelty of the universe, and the impermanence of these thrills, that puts Connors on his path to salvation rather than any innate morality. Murray's transformation is gradual and organic - there's no hint that Connors has always been a good man waiting to blossom (it's fair to say he always has been and, in other circumstances, would be doomed to live life as a bitter and self-centred individual until the day he died). Crucially, Murray's performance seems neither contrived or understated - we can share in his glee at self-discovery and believe it real. Many of the more pseudo-intelligent films of recent years, including Inception and Memento, have focused on the rewards a viewer may get with a second or third re-watch but, more often than not, these movies lose their power very quickly - once their narrative has been "solved", there's nothing else on offer. Groundhog Day, however, is the opposite of this - once the punchlines have been memorised and, perhaps, the laughs have faded, Ramis' movie teases its viewers with an infinite amount of interpretations and lessons that can be culled from it. Another triumph is that no message is ever hammered home and equally Groundhog Day is never so oblique as to become meaningless - there's messages to be learnt if you'd like or, if you'd prefer, it's just as acceptable to revel in the hilarity of Connors' increasingly agitated reactions to Ned Ryerson. It's a rare feature which could work equally as well as a movie on a date night or as the basis for an academic essay (in a variety of different subjects and areas of study). It's a film to be treasured and watched over and over with joy. * Whilst I may have chosen a Christian prayer to illustrate this point, the strength of Groundhog Day comes with its universalism - its a narrative which equally promotes many of the tenets of Buddhism, Judaism, Falun Gong or any other religious movement imaginable, alongside the teachings of philosophical movements like Confucianism. Its a text which can be co-opted by any movement which strives for discovery and inner peace.